The front page headline of your newspaper ('Death of the town', Irish Independent, November 30) makes for disturbing reading. 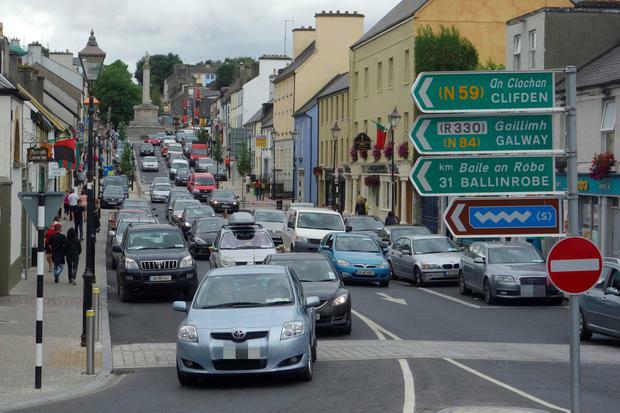 The report goes on to say that small-town Ireland is facing a "perfect storm'' which has torn the heart out of life on our main streets. It further states that a lack of local leadership and permitting out-of-town retail developments means that many rural towns across the country were "decimated" since the financial crash. The late, great journalist John Healy was warning 50 years ago in his book 'No One Shouted Stop!' about this very same scenario in his native Charlestown, Co Mayo. Inspirational local leadership in rural towns and villages is vital if they are to survive and prosper. Local leadership in these communities must now grow, develop and step up to the plate in order for the town or village to survive and flourish. Thriving towns like Westport in Co Mayo, Naas in Co Kildare, and Clonakilty in Co Cork are bucking the trend and showing all of us the way forward, with their innovative policies and programmes. The closing down of so many vital local services in banking, post-offices, Garda stations, old business establishments, manufacturing units in food and dry goods, and the centralisation of government departments to the bigger urban centres in recent years, has had a devastating effect on small rural towns. So how do we stop the rot? Government policies must continue to evolve and support strong local leadership that will help our small and medium-sized rural towns to survive and thrive. This twin-track approach must begin immediately. Otherwise, the majority will quickly follow the struggling towns of Kiltyclogher, Tubbercurry, Tipperary town, Ballylongford and Mountrath in the slow dance to impending doom. Christmas, while widely depicted as a joyous and happy time, can for whatever reason bring on perilous feelings for so many. Not even all the glittery lights are enough to hide the doom and gloom many feel at this time of year, and the copious amounts of Christmas ads splashed on TV and radio do little to distinguish the feelings of isolation and fear many feel. Taoiseach Leo Varadkar's reluctance to tackle the housing problem first-hand says little of his courage or conviction as leader; yes, landlords should enjoy equal protection under the law, but where is their kindness? Is it reasonable to charge €1,000 for nothing more than a pimped-out shed? Even the woman who lived in her shoe had more square feet than apartments now for rent. More affordable housing needs to be built, more jobs need to be assigned to rural areas to help decrease demand in Dublin and, more importantly, renting costs need to be frozen. If the landlord and the tenant can come to a mutual agreement whereby the landlord enjoys a comfortable arrangement without much hassle, surely the cost of rent can be decreased? Where is the reward for good tenants? Or better still, given the prohibitive cost of renting, shouldn't payment be considered sufficient as proof of being able to pay a mortgage? The Irish people are forced on this endless merry-go-round of renting and being unable to save for a mortgage. In the wake of the 'Late Late Toy Show', I've noticed a spike in shrines and altars appearing around the country, in honour of Ryan Tubridy. Such is the adulation poured upon the man after simply hosting a TV show, one would think a canonisation was imminent. Let's - everyone - take a breath and calm things down. In my experience, I've rarely met a male of the species who is overly fond of Tubs. He comes across as a little too hyper and perky for our liking. Of course, in front of females, we obediently gush over the man, but secretly we recoil. I'm sure Ryan is an all-round decent guy. But, please, we are Irish and he is an affront to our male cynicism. So folks, before you canonise 'St Ryan of Perkiness', please spare a thought for the silent male majority who dream about a return of the calm assurance of a Gay Byrne or a Pat Kenny. Cross-party support amongst political parties does not often happen in Ireland - in fact, it is about as rare as hen's teeth. However, yesterday was one of those days when a hen must have grown teeth. It may have had something to do with this 'new politics' I hear so much about which was supposed to benefit the citizens, but yesterday we witnessed it in action. The cross-party, unanimous support from Fine Gael, Fianna Fáil, Sinn Féin, Labour, the Green Party and Independent TDs was for a proposal to double the salaries of Fine Gael, Fianna Fáil, Sinn Féin, Labour, the Green Party and Independent councillors. It's good to know they can agree on such a contentious issue. Once upon a time, Irish people would utter: "The curse of Cromwell." Today, the Tories in England must be cursing Lloyd George, prime minister of the UK from 1916-1922, the man who created the 'six counties' which for the past 40 years have been nothing but an albatross around the neck of the UK. Indeed the old adage "be careful for what you wish for" comes to mind.